When earthquakes and high tides came to the Mediterranean area 1200 years ago, Egypt lost two great seaside cities into the depths of the water. Very busy workers in the last seven years have been recovering thousands of artifacts. The result is a traveling exhibition called the "Sunken Cities: Egypt's Lost Worlds." Now the exhibition for the first time is in America at the St. Louis Art Museum. Even the names of the cities had been lost to historians. Now we know not only their names but are awed by the richness of the combined Egyptian-Greek culture that had existed there. 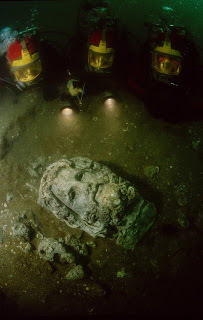 The largest city was Thonis-Heracleion where much of the trade with Greece was carried out. This is where the new Pharaoh would come to be legitimized by the Gods. Nearby was Canopus, a city that drew pilgrims from all around the Mediterranean to its many shrines. We arrived in the morning to find the exhibit already crowded. The tickets gave entry times so they could control the large number of people eager to see the unusual display that had already been to the Museum Rietberg in Zurich, the British Museum in London, and the Institut du Monde Arabe in Paris. A movie introduced us to what we were to see by taking us to the depths of sea four miles off the coast of Egypt where we got to watch the divers discover the treasures that seeming lay randomly in the muck and sludge of the bottom. It took seven years of underwater excavation led by Franck Goddio, president of the European Institute, for Underwater Archaeology to gather the artifacts for this exhibition. The Sacred Bull Apis, when Apis Bull died all of Egypt morned. We were about to see excavated material that included colossal statues, inscriptions and architectural elements, jewelry and coins, ritual objects and ceramics. Continuous films were playing on screens around the exhibition about the underwater world where the artifacts were found. In the film they would find an object, examine it and bring it to the surface. On the wall nearby the TV screen we would find the discovered object on display. The earliest statues found were done in the Egyptian style, leg forward, arms to the sides. Over the years of interaction the Greek influence became apparent: more body movement, more expressive faces, and hair styles were different. But something else was happening-- the Egyptian Gods were beginning to blend with the Greek and taking on other names. For example, the Egyptians worshipped Hapy, the God of the Nile flooding. Based on Hapy the Greeks created and venerated Neiles. Neiles had thick curly hair, a heavy beard and wore a himation, a kind of cloak. Some artifacts are more striking than others. One is the life-sized statue of the sacred Bull, Apis, who represented the god Ptah, a powerful oracle and source of prophecy. A real bull was chosen by the priests as a representative, and when he died the nation mourned. A section of the exhibition focuses on the Osiris, God of the afterlife, that introduced me to some new information about him. There had been an annual water procession between Thonis-Heracleion and Canopus commemorating the murder and resurrection of Osiris. Several of the statues show Osiris waking from the dead. One of them has him on his stomach with his head just raised as he comes back to life. 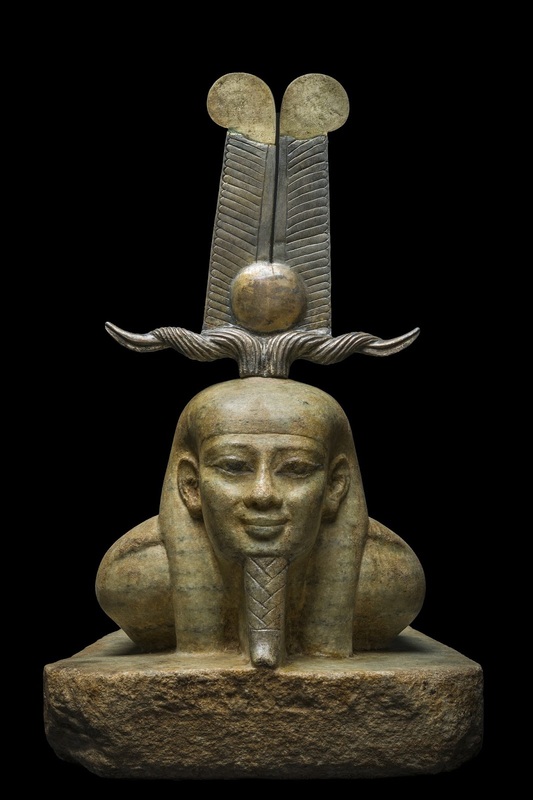 The figures of Osiris were often made of symbolic ingredients, such as soil from the Nile River. These figures were then used during rituals that recreated and celebrated the god's death, dismemberment, reassembly, and resurrection. The rituals were to insure the yearly flooding of the Nile, so necessary for the life of Egypt. The overlap of his murder and resurrection with our own Christian story startled me. The exhibition will be at the St. Louis Art Museum until September 9. Visitors are charged for entry to the exhibition except tickets are free on Friday's. The museum is open until 9 pm. Osiris, God of the Nile, shown in his rebirth.